At a ceremony in Abu Dhabi, Etihad Airways, one of the world’s leading airlines, welcomed the first of its ten new Airbus A380 aircraft. Etihad Airways is the thirteenth airline to operate the A380, and the aircraft is the 150th A380 delivered by Airbus. The delivery is set to boost capacity on several of Etihad’s most in-demand routes, taking the airline to new heights as it continues to redefine the flying experience. Setting new benchmarks in onboard product, service, hospitality and style, Etihad Airways has invested in enhancing the passenger experience through the acquisition of Airbus’ game changing A380. The A380 offers airlines increased capacity, long-haul range, fuel efficiency and improved performance but also immense flexibility in cabin choices, as yet again demonstrated by Etihad Airways. 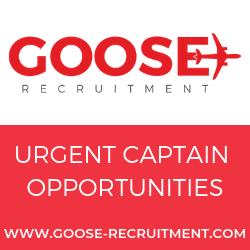 The aircraft is a firm favorite for passengers as it brings an exceptional in-flight experience with a smoother flight, quieter cabin and the highest level of comfort available in the sky. 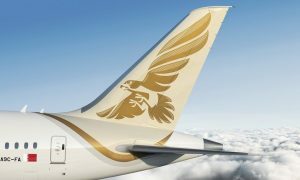 “Since its inception, Etihad Airways has experienced exponential growth and we’re pleased to have contributed to that success. 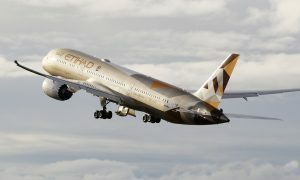 I am convinced that our flagship, the A380, will provide an efficient solution to support Etihad’s continued expansion,” said Airbus President and CEO, Fabrice Brégier. Etihad’s A380 is designed to carry 498 guests in four living spaces on the aircraft, including two VIP guests in The Residence by Etihad™, nine guests in the First Apartments, 70 guests in the Business Studio, and 417 guests in Economy SmartSeats. Equipped with the latest entertainment systems and the plush surroundings of Etihad Airways’ interior, passengers can expect an exceptionally comfortable journey. Etihad’s first A380 will make its debut on the popular London Heathrow route, from Abu Dhabi International Airport, in December. 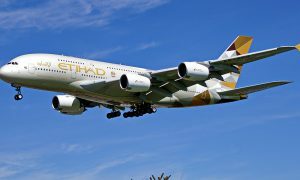 By the end of 2015, Etihad Airways will have five A380s in operation, with plans to introduce the aircraft on the airline’s Sydney and New York JFK routes.